The colourful festival of Holi is celebrated in the month of March which is right around the corner. On this day, people hug and wish each other 'Happy Holi' and the celebration begins with lighting up of bonfire on the Holi eve. The next morning is a free-for-all carnival of colours, where people play, chase and colour each other with dry powder and coloured water, with some carrying water guns and coloured water-filled balloons for their water fight. Holi also gives a wonderful chance to send blessings and love to dear ones wrapped in a special Holi gifts. What could possibly make a better gift than clothes? The perfect attire for this traditional festival is a saree! It’s time to shop for yourself and your special someone! Breathe some colourful new life into your closet with vibrant shades. Wearing colour can do amazing things for your skin tone, hair colour, and overall appearance. How to add colour to your wardrobe? If you don’t normally wear lots of colour, dive in head first by throwing on the first bright piece you see. You can also add colours to your accessories and shoes. Use a vibrant bag and shoes to rev up an outfit. Grab colours like juicy orange; it flatters everyone! You can also mix colours in one colour family. Pick different shades in the same palette (assortment of pink or blues) and try different fabrics. 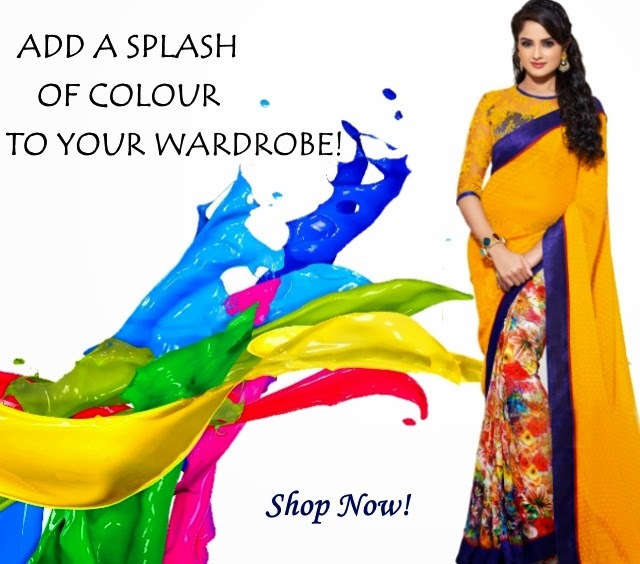 This Holi look gorgeous in these vibrant & colourful sarees!